Meanwhile, a Utah Highway Patrol trooper traveling south on SR-18 heard the broadcast and turned onto the side road. After spotting the truck, the trooper performed a traffic stop, UHP trooper Mike Murphy told St. George News. As the trooper approached the truck, he observed two men and a woman inside, Murphy said, but before he reached the driver’s side window, the driver sped off. While the trooper initially pursued the Dodge, department protocols mandated that he stop the chase once the driver pulled off on a dirt road. At that point, additional units were called in and a containment area was set up. Iron County Sheriff’s Office also requested assistance from Southern Utah University’s Aviation program to provide a helicopter crew for an aerial search of the area. 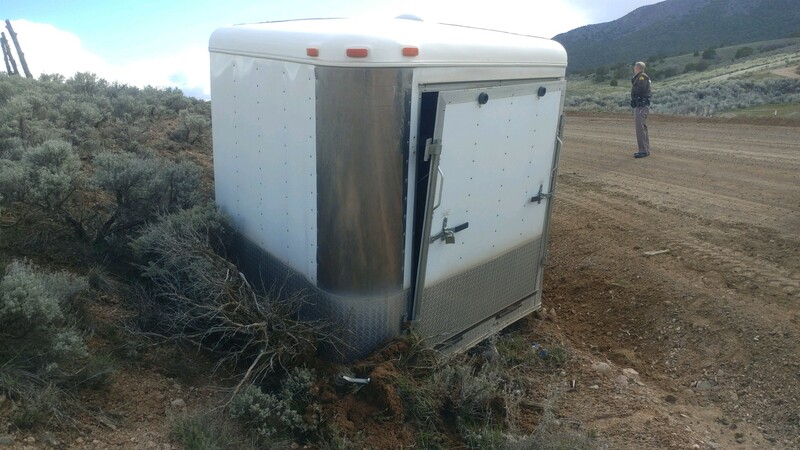 As the trooper made his way down the dirt road, he found the utility trailer abandoned on the side of the road with the hitch smashed into the ground. “We think one of the suspects from the front of the pickup climbed through the truck’s window and disconnected the trailer while the pickup was still moving,” Murphy explained. 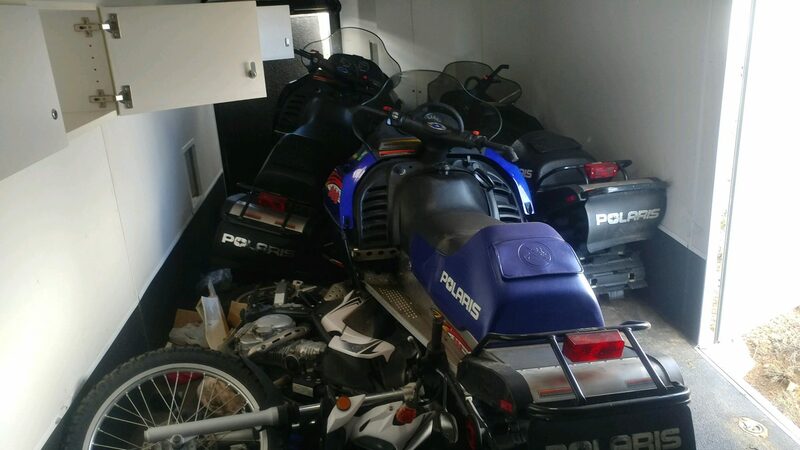 Troopers found three snowmobiles and a motorcycle that were all reported stolen inside the trailer, UHP trooper Jim Jessop said. The owner of one of the snowmobiles was contacted and responded to the area where the trailer and other property was found abandoned. Not long after, SUU’s helicopter crew located the Dodge, which appeared to have been ditched at the bottom of a canyon approximately 2 miles southwest of Pinto. When troopers reached the vehicle, they determined it had become disabled on the dry riverbed where the two suspects left it before both they fled on foot. In the meantime, a Utah Department of Public Safety helicopter equipped with night vision and infrared tracking technology was launched from Salt Lake County to assist in the search for the fugitives, which Jessop said continued well into the night. The aerial search was unsuccessful in picking up any heat signatures from the suspects in the area, Murphy said, due in part to the many cattle and other animals scattered throughout the region that made zeroing in on anyone nearly impossible. At 11 p.m., a Utah Department of Natural Resources ranger observed a woman matching the description of one of the truck’s passengers walking along Pintura Road less than a mile east of SR-18, Jessop said. The woman was arrested after a records check revealed she had four active warrants. She was booked into jail on the warrants only and has not been charged with any offenses relating to the pursuit. Jessop said troopers have identified the two suspects who are still at large but are not releasing any additional information at this time as this is an active investigation.